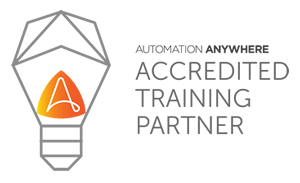 We are an Accredited Training Services Partner of Automation Anywhere, the world’s leading automation platform. Our Anytime Anywhere training model is designed to provide world-class automation training - from anywhere, and at any time. looking to build knowledge on RPA, Automation and Automation Anywhere, we can help you scale up and test your skills in an integrated learning environment. Enroll in a course now. looking to build a highly skilled team of Automation Engineers, please look at our unique Triple-A Model where we hire, train and deploy teams of automation experts. In other words, we BOT your bot factory. We are focused on providing the real life experience of developing Bots! We do this through many practical examples and scenarios built into the training with information that is gained from implementing real solutions at our clients. We deliver the content in a gamified and fun environment making learning lot more interesting and with a focus that it stays with you even after you have left the course and you are able to use immediately after. Our training materials and development environment is available to you days after you have finished the course and provides with reinforcements that you need to put you on successful professional path. Training is everything. A cauliflower is nothing but a cabbage with a college education. Automation Anywhere Advanced RPA Professional Certification directly from Automation Anywhere. This course is currently available at a special price of 1200 USD. The discount will be applied during checkout. The weekday programme runs from Monday to Friday over two weeks with 10 sessions of 2 hours each. Sorry, there are no Weekday courses currently available. The weekend programme runs on Saturday and Sunday over two weekends. There are 4 sessions of 5 hours each over 4 days of two weekends. Sorry, there are no Weekend courses currently available.